Fingle is a small Bed & Breakfast set in beautiful surroundings in the village of Uplyme, near Lyme Regis an Area of Outstanding Natural Beauty at a gateway to the Jurassic Coast World Heritage Site. We cater for couples who are looking for a peaceful break in a relaxing atmosphere. Uplyme has a village shop and post office and The Talbot Arms free house, these are a five minute walk away. Fingle is situated one mile from Lyme Regis and there is a path from the garden that takes you along the river Lym into the heart of Lyme Regis, it takes approximately 25 minutes. Each room has TV, hairdryer, tea and coffee making facilities, bottled water and wine glasses (if you need wine cooled it can be kept in the fridge). WIFI is also available. 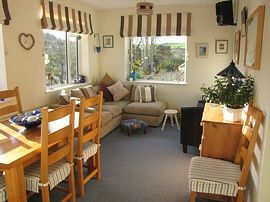 Breakfast is served in the sun-lounge over looking the garden and the valley of Uplyme. Much pride is taken on providing a quality breakfast with much of the food sourced locally. We are very lucky to have excellent high quality food outlets in the area. On arrival there will be a complementary tray of tea/coffee and home- made flapjack. Guests are able to relax in the sun-lounge and the garden. Unfortunately we do not accommodate children or pets. 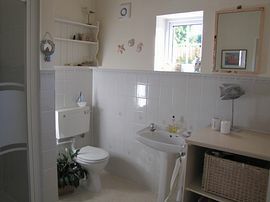 Fingle is situated on Pound Lane, Uplyme 150 metres away from St Peter and St Paul's Church. No single night bookings are taken for this room. Dressing gowns are provided with this room. 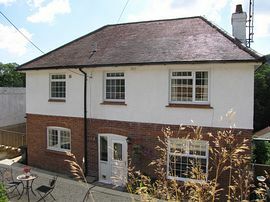 £70.00 per night for a single night booking. 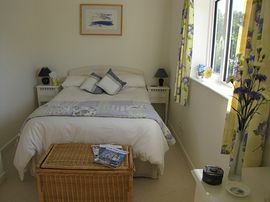 £60.00 per night for two or more nights (two people sharing).